This application shows one example to configure the mobile POS system using native application at a stadium or food court including TM-mobile printer and TM-DT. The Web server on the Internet provides the back office application for each outlet. For the POS system at a stadium/food court, the mobile POS will have the benefit to sell goods, foods and/or drinks everywhere you want in a wide area. In this case, Bluetooth interface will be suitable choice for communication between a mobile device and mobile printer. To control the Bluetooth interface, the application for mobile device should be native application developed using SDK provided by Epson for iOS, Android OS and Universal Windows Platform environment. Using mobile POS with a mobile device and a mobile printer, the clerk can check out the sales for a guest everywhere at the stadium or food court. 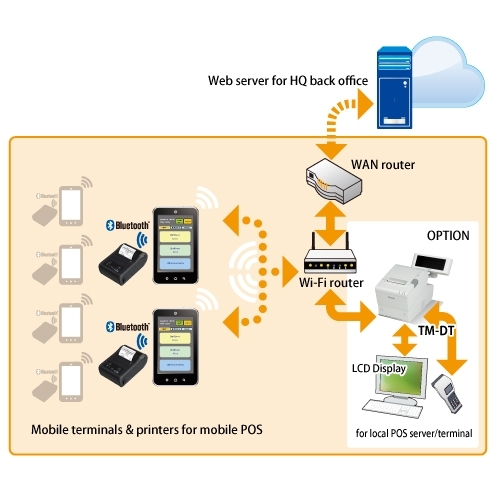 A TM-DT can work as a local server for mobile POS system or a local POS system with very small footprint. This saves much space for a POS system.